We'd all love to purchase everything we want anytime we want, but most of us don't have that luxury. 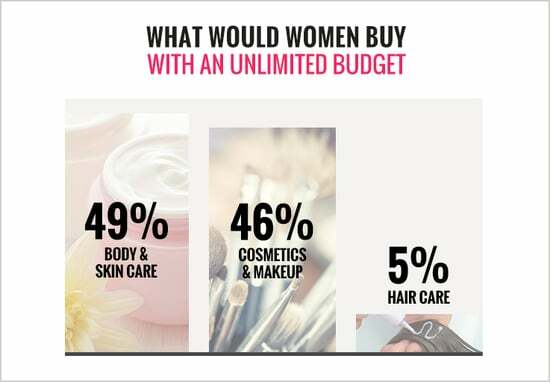 As part of the POPSUGAR Insights Q2 2014 beauty study, we asked women to dream a bit and tell us which category of beauty products they would spend the most on if money were no object. Overall, 49% of women said that if money were no object, they would spend the most on body and skin care products. Forty-six percent of women said that they would spend the most on cosmetics and makeup with an unlimited checkbook. Only 5% of women said they would spend the most on hair care products, but that might be because they'd be spending more time at the salon or blow-dry bar.